Jean-Marie Le Pen, the founder of France’s far-right National Front party, says he is “ashamed” his daughter – current party leader Marine Le Pen – still bears his surname. Amid a growing feud, Jean-Marie Le Pen said he hoped she “would get married as quickly as possible so as to change her name”. Jean-Marie Le Pen, 86, added he would not support his daughter in presidential elections in 2017. His remarks came after the far-right party suspended Jean-Marie Le Pen, 86, after he repeated his view that the Holocaust was “a detail of history”. Marine Le Pen, 46, has been trying to steer the National Front (FN) away from its racist and anti-Semitic past. Her view is that FN’s growth is being held back by memories of what the far-right party used to be, and that to move to the next level it must cut itself free from its past. 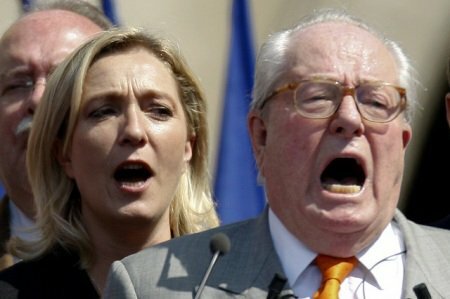 Speaking to France’s Europe 1 radio, Jean-Marie Le Pen said: “I was hoping that the president of the National Front would get married as quickly as possible so as to change her name. Jean-Marie Le Pen has been suspended but not dismissed by the party – a decision he described as a “felony”. An extraordinary party congress is expected to be held within three months aimed at ending the function of honorary president – which Jean-Marie Le Pen has been holding since stepping down as leader in 2011. Some commentators have suggested Jean-Marie Le Pen could be more of a risk outside the party than within it. Jean-Marie Le Pen still holds a seat in the European Parliament and a post as a regional councilor in the south of France.